I wanted to share important news about a new and unique model I am offering to the industry…one that provides accurate pre-campaign estimates of the ROAS (Return on Ad Spending) of targeting a segment relative to the campaign overall. The ROAS predictor model is quite robust; the correlation of the model is over 90% and the model correctly classified 87% of segments as over vs. under-achievers, ranging from a ROAS performance index (relative to campaign average) of .05 to 25 times average. The model offers the truth of two targeting principles: propensity and propinquity. That is, the higher the propensity that someone has to buy a given brand (brand loyalty and heaviness of use), and the greater the probability that the purchase will occur soon (propinquity or ‘recency’), the greater their responsiveness to advertising for a given brand. For example, based on “The Persuadables” work, heavy and medium buyers of a brand based on frequent shopper data deliver 3-8 times higher ROAS…power of brand propensity. Those close to an upcoming purchase are twice as responsive as those who aren’t…propinquity. Want to target non-buyers? Expect 60 cents on the dollar return unless you sub-segment them as I will describe. New products. For example, using the MoreCastR model I created in 2016, we can see why creating a segment of High Propensity Triers (HPTs) for a new product works. Combining survey questions about reaction to a concept and modeling behavioral factors, we can differentiate the propensity of different consumers. The top 20% or so are HPTs. Now, based on the new ROAS predictor model we know they will be 2-4 times more responsive to advertising. Target disproportionately more of your budget to HPTs and you are sure to drive more trial for the same budget. Smart targeting of non-buyers towards an existing brand. Indiscriminate spending against non-buyers returns 60 cents on the dollar. Here is a better way. A sub-set of non-buyers actually have positive impressions of your brand. In 1996 I published a paper in the Journal of Advertising research that was based on recontact research proving that sub-set who are favorable converts at 5 times the rate over time. Using MoreCastR we can identify them at scale…HPTs towards your brand. THAT is your non-buyer target. Testing segments. The digital ecosystem offers thousands of segments for targeting. For example, there are probably 20 or more segments out there for health-conscious consumers. How would a marketer like General Mills, Chobani, Whole Foods, or Soul Cycle know if any of them will be high performing? Knowing if they are REALLY health conscious is only one step…you need to measure propensity and propinquity and then forecast their relative ROAS. This can now be done via services offered by a partnership I am in called Jolt! Marketing is moving away from mass advertising, towards programmatic targeting which now accounts for 80% of digital display and is rising with addressable TV advertising as well. Yet, marketers are still grappling with the science of targeting. In my consulting I have seen a segment designed NOT to perform (demo subset of non-buyers intended for conquesting) and then the publisher was challenged why their media wasn’t producing results! I have seen the programmatic parts of media plans direct over 50% of funds towards segments that we now know, through the lens of this model, were underperformers by DESIGN. Imagine if the 50% of programmatic funds that are wasted on poorly constructed segments were redirected towards high performing segments? Imagine if we can get targeting right? Post-script: the new science of targeting is really the culmination of research on research I have been doing for decades from when I was at Unilever (US head of analytics), The NPD Group (Chief Research Officer), The ARF (Chief Research Officer), and now in my own consulting business. Here is a description of my learning journey that has led to an ROAS predictor model and MoreCastR to construct high performing segments within non-buyers. 1993: Price elasticity and loyalty. The price that consumers are willing to pay (net of promotions) is directly related to their degree of loyalty towards the brand (more loyal will pay higher average prices). Analysis of home scanner panel data in support on a brand equity study on all brands across 4 baked goods categories. 1996: Power of brand favorability as a predictor of future loyalties. By conducting recontact research one year later, we found that you steal other brand’s customers at 5 times the rate if they have favorable opinions of your brand. Published in JAR 1996. 2014. Those who like you on Facebook like you in real life first! Facebook fans are 5 times more likely to be visitors to a brand’s website in the months before liking the brand. Using the ROAS predictor model, we can now translate this into ROAS performance lift relative to average. Results presented at the Future of Advertising Forum sponsored by Wharton. 2018. ROAS predictor model. 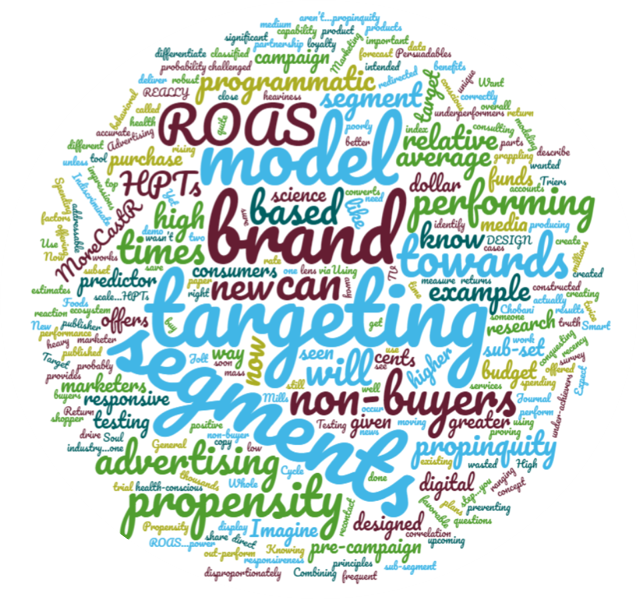 The ROAS (Return of ad spending) of targeting a given segment is highly related to its rate of buying the brand based on multivariate, non-linear regression model. First documented here.